On Wednesday Hacienda Tres Rios was invited to witness a turtle release at Xcaret. The park is dedicated to preserving the flora and fauna of the Riviera Maya. 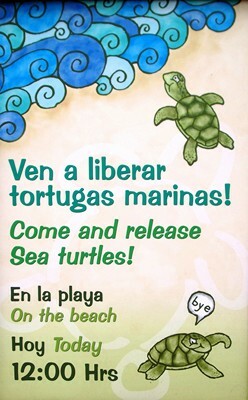 For this particular program green or white sea turtles are raised in the park until they are 15 months old and then they are then released into the Caribbean Sea, their natural habitat. Visitors and local school children can witness and even participate in this heartwarming process. Here come the turtles! The children named this turtle “Marisol” before they released it. The school children gently lower Marisol into the sea. Sometimes the turtles don’t head straight for the open ocean, so the Xcaret employees have to give them a little help. This young man will take Marisol out to the open sea. After the turtles were all swimming happily towards the ocean, we went to see some of the baby turtles that will be living at Xcaret until they are 15 months old. Baby turtles are very cute. Sea turtles can live to be around 100 years old. Females can produce about 100 eggs at a time, but only 1% of these will survive to reproductive age. This is why Xcaret waits to release them, to give them a better chance of survival. This turtle is about 19 years old. You can help these turtle simply by visiting Xcaret. A portion of the entrance ticket goes towards this program. Note: Never throw garbage on the beach or in the ocean because turtles mistake it for food. Plastic grocery bags are especially dangerous as in the water they appear to be jellyfish, one of sea turtles’ favorite foods.